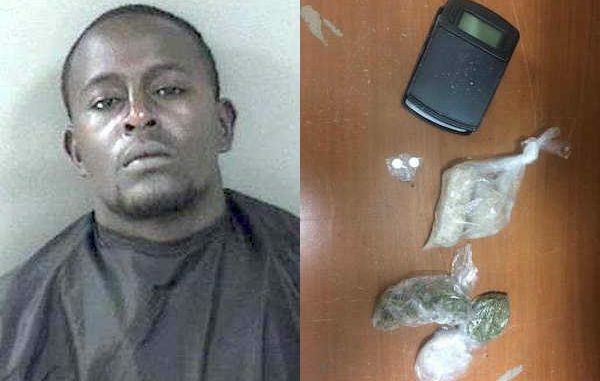 Police arrest drug trafficker in Vero Beach. VERO BEACH – On July 14th, at approximately 2:23 p.m., a Vero Beach Police officer pulled a motorist over for speeding in the 3700 Block of State Road 60. The officer made contact with a male driver, a female passenger, and three children in the vehicle. The driver stated to the officer that he did not have a Driver’s License in his possession. After providing the officer with a name and a date of birth, the driver stated that his license was suspended. Through the investigation on scene, it was determined that the driver provided the officer with a false name, and he was identified as Keith R. Walker, DOB 09-08-1993. Walker’s Driver’s License was in fact suspended, and he had an active warrant out of Indian River County for a Violation of Probation. Upon the search of Walker’s person, the officers on scene located several types of drugs and paraphernalia concealed in his clothing. The officers recovered approximately 5 grams of cannabis, 2 Hydromorphone pills, and 57 grams of crystal/rocklike Methamphetmine substance, identified by the subject as “Molly.” The officers also located an electronic scale with white residue in the subject’s pants pocket. Walker was arrested on scene and charged with Felony Trafficking in Methamphetamine, Felony Possession of a Controlled Substance, Possession of Marijuana under 20 grams, Possession of Drug Paraphernalia, Driving While License Suspended with Knowledge, Providing a False Name to a Law Enforcement Officer, and IRCSO Warrant for a Violation of Probation (Possession of less than 20 Grams). Walker is currently incarcerated in Indian River County Jail with no bond.